Each industry has specific requirements that sets it apart and, of course, distribution is no exception. 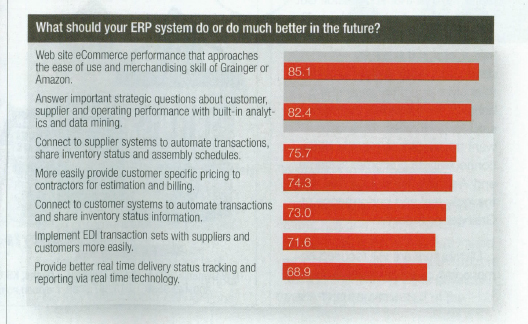 Neil Gillespie and Allen Ray recently wrote about “What Distributors Want” in a recent issue of Industrial Supply, where they gathered data from a study by Growth Wizards to determine what distributors are really looking to get out of their ERP systems. As it turns out, many distributors are very dissatisfied with their current systems for a number of reasons, and are looking for change. According to the study, 50% of distributors do not currently trust the support and development of their existing system, and are considering a move to a new system in 3 years or sooner. Many vendors are not currently delivering on key requirements and it is beginning to show. Let’s take a look at the areas they have identified for improvement & their strategic objectives. Many distributors do not feel that they are receiving the level of attention they deserve from a development standpoint. Large software vendors may offer solutions across a variety of industries, and distributors feel that their distribution needs are being put on the back-burner. This stresses the importance of finding a vendor that is specific to your industry (e.g. distribution ERP software) or finding a vendor that is focused on constant development within your industry. There is also a general distaste for the lack of education being provided. Distributors want solutions to their business processes, and not just the technology itself. They want vendors to work with them to streamline and automate their business so they can compete to the best of their abilities. Therefore, it is important to find a vendor that helps you improve your business processes. The medium-term strategic goals outlined by the survey respondents were eCommerce websites and better customer and vendor data/analytics. Distributors are pursuing opportunities to implement eCommerce integrated with their ERP software systems. They recognize the strategic benefit that an eCommerce webstore offers – a low-cost salesperson that is available for selling 24/7. Customers are demanding easier ways to order, and online systems are certainly the way to go. With customer-specific logins, distributors can maintain tiered-pricing for different customers while allowing them to enter in their own orders. The second piece to this puzzle is customer analytics. Distributors want better information to help them compete. They are looking for more robust reporting, analytics and data-mining abilities from their ERP systems. Proper ERP systems should be able to provide an abundance of data and offer many options for getting that data out of the system. This data can provide extremely valuable insight for making strategic decisions on top of everyday tasks like purchasing. This does not have to be either costly or complicated, although many vendors seem to make it so. The bottom line: many distributors are looking for better solutions for their business to increase their competitiveness in the market – are you?